Can buffalo bring tribal food sovereignty to Pine Ridge? Under the massive South Dakota sky the grassy plain goes on for miles. This harsh, majestic land is part of the Pine Ridge Indian Reservation, the country’s second largest. About 40,000 Oglala Lakota make their home on 2.8 million acres in southwestern South Dakota, an area larger than Delaware and Rhode Island combined. Unemployment hovers around 90 percent. Life expectancy is lower than anywhere in the Western Hemisphere except Haiti. Diabetes, heart disease, and obesity occur at rates significantly higher than elsewhere. But the Pine Ridge Lakota do have one resource their ancestors would have understood and appreciated—about 900 wild Lakota buffalo, one of the last remaining genetically pure buffalo breeds in the country. These massive animals represent what they always have to the Lakota: food, warmth, shelter, and a connection to traditions and beliefs that predate the arrival of the white settlers who nearly destroyed the population of U.S. buffalo in the 1800s and nearly removed the Lakota from their ancestral land. The tribe harvests a handful of buffalo each year. The most the tribe has ever processed in a year is 60, says Tom “Al” Fast Wolf, the herd manager. About 25 bulls are sold for sun dances, with the remainder sold to schools or donated. One buffalo can provide food for a few hundred people, a significant amount in a place where the local food bank feeds about 3,000 families per month. 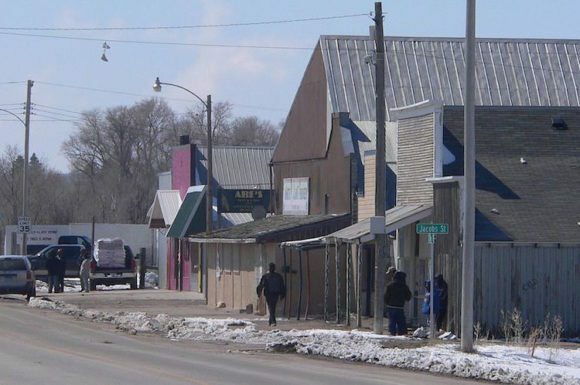 If things go according to plan, though, the number of buffalo the tribe processes should increase this year, thanks to a project launched by One Spirit, an organization that works to provide food and housing on Pine Ridge. The group has built the Meat House, a facility where the Lakota can process their buffalo according to tribal customs—and also in a way that could potentially create a business selling buffalo meat to the broader market, providing much-needed jobs and revenue. The story is a fascinating case study at the intersection between cultural values and business, but it’s also a reminder of both how little money it can take to create a revolution in a local food system—and how hard that money can be to obtain. Here’s how the reservation gets its buffalo today: The animals technically belong to the federal government, which maintains and feeds a herd in the Badlands National Park, part of which is on Lakota land and co-managed by the tribe. The park can support only a limited number of buffalo, and the Oglala Sioux Parks and Recreation Department buys surplus animals from the Badlands park for a “round-up fee” of between $1,000 and $1,800 per buffalo, depending on size. The buffalo are brought from the Badlands to four pastures on Pine Ridge, where they are cared for by members of the tribe. The way the buffalo is handled from the beginning, it’s a sacred thing. Nothing is wasted. Tribal hunters shoot the animals humanely in pasture, after which some are skinned and butchered by backyard meat cutters. But there’s a real limit on capacity. “Not everyone on the reservation knows how to process buffalo or has a cooler, but they still need food,” says Charles “Bamm” Brewer, Jr., who has worked most of his life as a meat cutter and is One Spirit’s food program manager. To supplement its own efforts, the tribe needs to use an outside processor. The nearest one is an hour away in Nebraska. It charges the Lakota $800 to process a buffalo, which the Parks and Recreation Department then sells to tribal members for sun dances ($600) or to reservation schools ($400) donates to families in need as well as for wakes and funerals. To the tribe, the problem is not just that the process is cumbersome and expensive. It’s that precious dollars get exported off-reservation—and that wrests control of a culturally sensitive activity from the tribe’s hands. What is of most cultural importance to the Oglala Lakota is that the buffalo sacrifices its life to the tribe, explains Jeri Baker, One Spirit’s executive director. During the First Kill Ceremony, a tribal hunter will enter a sweat lodge to purify himself before the hunt. This is followed by a Wopila, or “thank you for the sacrifice” prayer to the buffalo after it has been killed. Aside from using the buffalo’s meat, the tribe “brain tans” buffalo hides—applying cerebral matter to hides to make them soft and supple—to be used as clothing; uses the skull for ceremonies; and makes traditional taniga soup using tripe, among other things. For the Oglala Lakota, buffalo are also an essential part of womanhood and manhood ceremonies, sun dances, wakes, and funerals, and are part of an indigenous diet that also includes deer, antelope and chokecherries. “The way the buffalo is handled from the beginning, it’s a sacred thing. Nothing is wasted,” says Baker. Processing the buffalo on the reservation also allows the tribe to have more control over how the finished product looks, explains Brewer. “It’s just that we want it done our way. We need to do it ourselves,” he says. The economic plan for the Meat House processing facility is a work in progress. The project has already created jobs—employing tribe members during the building phase—and will hire more meat cutters once it opens. It will also save the tribe money on fees formerly paid to outside processing facilities. As a “sharing society,” the tribe’s main goal is to make sure food needs in the community are taken care of. It’s not necessarily thinking about monetizing a commodity off the reservation that has traditionally been a key component of its culture. And yet, there’s hope that the Meat House can in fact give the tribe a way to generate cash. Given recent trends in food consumption, more people are turning to buffalo because it’s organic, grass-fed, and low in calories and fat; according to the National Bison Association, it’s also a $340 million-per-year industry that the tribe wants to be a part of. “One of the goals they have is to put a Lakota-branded meat on the market,” says Baker. With that in mind, One Spirit has built the facility with the goal of achieving USDA approval—a must if meat processed there is to be sold on the open market. Brewer, who has been in communication with USDA officials by phone, says that a state animal facility inspector has been out several times to make sure the Meat House is in compliance with codes. The next step will be an in-person USDA inspection. If the Meat House passes inspection, the Lakota will become one of the only tribes in the area to have a USDA-approved processing facility. Revenue generated from the business will initially be reinvested in the facility to increase its size. If the meat business generates significant profits, the money will be put into a trust for the Lakota tribe members. The pieces may be largely in place, but it is by no means certain that the Meat House will succeed. Native-owned businesses face a unique set of obstacles to getting off the ground. According to research from the Ewing Marion Kauffman Foundation, reservations located in isolated areas may be far from their potential customers, increasing the costs of doing business. Other obstacles include a lack of business mentors as well as an inconsistent and ever-changing set of rules for tribal entrepreneurs, according to the research. This is the circle of the buffalo’s life. He was born here, he lived his whole life here. The Buffalo Nation circle is broken. We don’t need to be taking it to the white man to be processed. On a much more fundamental level, it’s still not clear how soon One Spirit will be able to complete construction of the facility—or if it will be able to complete it at all. Even by the standards of bare-bones food startups, the Meat House has been a low-budget operation. The first phase of construction, which included erecting the exterior shell of the building, a water line hook-up, and cement walkways, cost $30,000, which came mostly in the form of donations. The remaining work—installing electrical wiring, insulation, finishing the interior, and installing the septic system, walk-in cooler, and cooling system—is expected to cost around $25,000, about the cost of a new pickup truck. The tribe launched a GoFundMe campaign in September 2015. To date, it has raised $1,030. But there’s no denying that the tribe has goals that are entirely non-economic. “This is the circle of the buffalo’s life. He was born here, he lived his whole life here. The Buffalo Nation circle is broken. We don’t need to be taking it to the white man to be processed,” says Brewer. Stefani Kim recently completed her Master’s in Journalism at CUNY Graduate School of Journalism. She is interested in issues affecting food sustainability, agriculture, and the environment. Stefani has written pieces on Native American food sovereignty, hog farms in China, and Chinese immigrants in Brooklyn for Native People’s Magazine, China File, and Voices of NY. Follow her @stefanjkim.